They met over a can of paint. Jim Vecchione, BS business administration ’10, and Maggie Regan Vecchione, MS learning technologies ’12, didn’t know each other as Drexel students. They were both employees at the University when Maggie’s roommate, who worked in the Office of Alumni Relations, organized an alumni community service event to spruce up a playground and recreation center in West Philadelphia. Maggie, then an instructional technologist at the LeBow College of Business, just happened to sign up as a volunteer. Jim, who was working as Drexel’s executive director of facilities, brought all the supplies. In the months that followed, Maggie and Jim would see each other around campus occasionally. “I even asked him to come to my office to fix my broken desk drawers,” Maggie recalls. Then they started dating. Drexel and the City of Philadelphia made for a perfect backdrop. “It was a really special time for us, and we had a lot of good times together at and around Drexel,” says Jim. 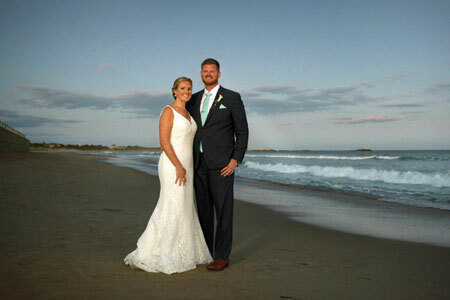 Maggie and Jim were married in September 2017 in Rhode Island where Maggie grew up and where they now live. Still working in higher education, Maggie is as an instructional designer at Brown University, and Jim is executive director of facilities at Bryant University.